We’ve all been there — frustrated when we get chips of eggshell under our nails, digging in until our egg looks as traumatized as we feel. 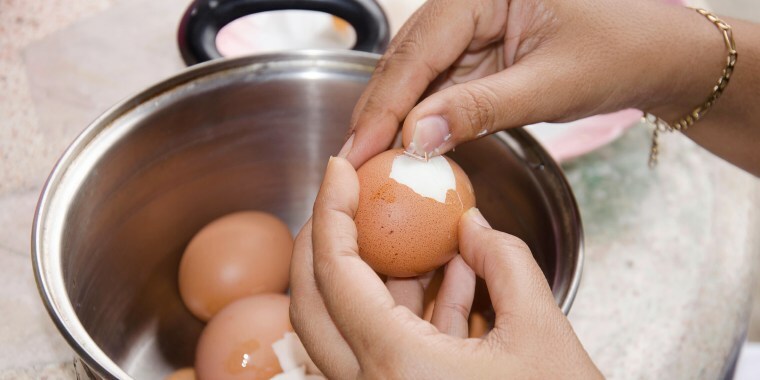 Once you've mastered how to make perfect hard-boiled eggs, you need to learn how to peel hard-boiled eggs without making a mess of the egg white or getting the shell stuck under your nails. We’ve all been there — frustrated when we get chips of eggshell under our nails, digging in until our egg looks as traumatized as we feel. There has to be an easier way, right?! You've boiled your eggs for egg salad, popped them in cold water to cool, and are ready to peel them. Only, they're impossible to peel and the shells have taken most of the whites along with them. To add insult to injury, the yolks are green, or worse, runny. Take the guesswork out of how to peel hard-boiled eggs by following these easy tips and tricks, then use a food writer's go-to hack for peeling large batches of hard-boiled eggs. 1. Use eggs that are not super fresh. While it may sound counterintuitive, slightly older eggs are much easier to peel. If you buy your eggs from the supermarket, they're most likely old enough, as the USDA allows for 30 days at the factory, and another 30 days for the sell-by date. But if you buy them from the farmer's market or directly from a farmer, ask when they were laid. In that case, you may want to let them sit for a week or two. 2. Start with boiling water. For years I started my eggs in cold water, which usually worked fine, until I tried the boiling water method, which is nearly foolproof. Bring a pot of water to a rolling boil, lower the eggs gently (I find a steamer basket works great) and boil vigorously for 30 seconds. Reduce the heat to a gently simmer over low heat, cover with a lid and cook for another 10 minutes. 3. Shock in cold water and gently shake. Immediately pour off the hot water, leaving the eggs in the pot. If you're using a steamer basket, carefully lift the basket and pour off the water. Return the eggs to the pot and gently shake it back and forth to lightly crack the shells. Immediately add cold water and a few ice cubes and let sit until cool enough to handle; it will take about five minutes to serve warm or 15 minutes to serve cold. The idea here is that cracking while warm and then cooling rapidly allows the cold water to shrink the whites just enough to separate them from the shells a bit. Using your hands, peel the cracked and cooled eggs under running water (but that's wasteful) or directly in the ice water bath. The water seeps under the thin film that clings to the whites and helps release the shell. I saw this method on YouTube and had to try it for myself. Crack the eggs at the fat end and peel a tiny bit with your fingers. Slip a spoon under the shell so that the curve of the spoon follows the curve of the egg. Rotate the egg and move the spoon to release the shell. This is a great method if you're only peeling a few eggs. 6. 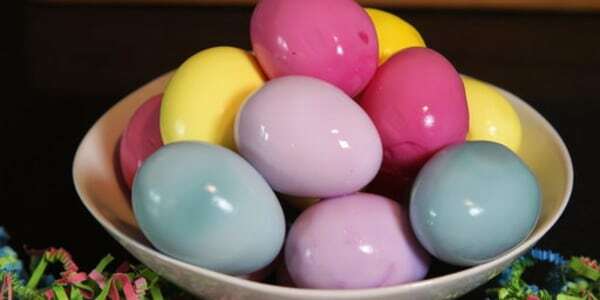 For large batches, place the eggs in a plastic container with some water and gently shake. Food writer Alessandra Bulow peels over 60 eggs every spring for her family's Passover seder and randomly learned her top method from a Japanese game show. 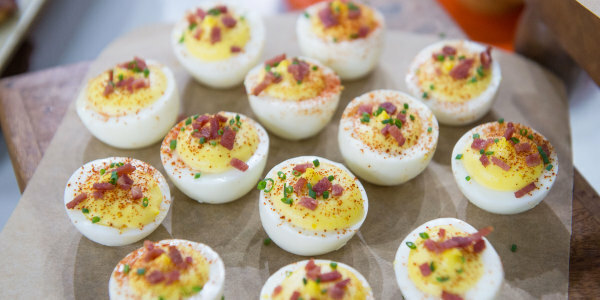 Here's her hack for how to peel hard-boiled eggs in large batches: Put five thoroughly cooled hard-boiled eggs into a small plastic container with some cold water, top with the lid and then gently rock and shake until the shells break and fall away. You'll almost always end up with perfectly peeled eggs. Repeat with the remaining eggs. This method works best when the eggs are thoroughly cooled and cooked using all of the above tips. Bonus: A cool gadget to help make perfect hard-boiled eggs. The one I like best is the Exact Egg Boiler from Casabella. It's like a steamer basket with an attached egg timer that fits inside a large saucepan. The timer changes color to reflect the level of doneness. It has a handle that functions as a funnel to distribute cold running water onto the eggs. While the eggs were perfectly cooked, I couldn't walk away from the stove for more than a few minutes at a time for fear of overcooking. After a second batch, I set my timer after the water came to a rolling boil to see exactly when the timer registered hard-cooked — about 8 minutes. While it's not an eggs-act science (sorry! ), by following these simple steps, your egg-cooking and peeling eggs-perience (ugh, sorry again!) will be a better one.